Light to medium intensity rains occurred in south Punjab! Yesterday’s low pressure over west Madya Pradesh and adjoining Rajasthan now lies over north Madya Pradesh and adjoining Utter Pradesh while the upper air cyclonic circulation is south-west of the weather system. Yesterday’s upper air cyclonic circulation in the north-west Bay of Bengal, it has intensified into a low pressure. The fifth monsoon spell has significantly weakened in the north as expected, partly/mostly cloudy weather expected in the northern areas with chances of showers/rain along with thunder/lightning in one or two areas of upper parts of Punjab (Lahore, Gujrat, Gujranwala and few adjoining areas), Azad Kashmir (Rawalkot, Kotli, Mirpur and adjoining areas) and adjoining Khyber Pakhtunkhwa (Dera Ismail khan, Tank and adjoining South Waziristan) till July 27. Light to medium intensity showers/rain occurred in south Punjab, chances of light to medium intensity showers/rain persist in south and central parts of Punjab till July 26/July 27 (Faisalabad, Multan, Bahawalnagar, Bahawalpur,Vehari, Dera Ghazi Khan, Okara, Pak Pattan and few adjoining areas). Slight chances of isolated heavy falls in Bahawalnagar district during that period. Partly/mostly cloudy conditions with chances of showers in parts of Sindh (Tharparkar, Mirpur Khas, Umerkot, Sanghar, Khairpur, Badin, Sukkur, Gotki and adjoining areas). Passing clouds (increase especially during night/morning) in Karachi, Thatta, Hyderabad and adjoining areas. From July 26/July 27, monsoon focus could extend till southern areas therefore around that time there could chances of light to medium intensity showers/rain with thunder/lightning in Sukkur, Gotki, Sanghar, Khairpur and adjoining areas after that from July 28/July 29 there would be chances of light to medium intensity rain/showers in lower parts of Sindh including Karachi, Thatta and Badin. Showers/light rain in parts of Balochistan (Khuzdar, Awaran, Panjgur, Barkhan, Lasbella, Dera Bugti, Musa Khel, Zhob, Qila Saifullah, Loralai and few adjoining districts) due to daily formation of clouds that can intensify into thunderclouds. Noorpur thal got 26 mm. Saidu Sharif got 21 mm. D I Khan got 5 mm. Yesterday’s well-marked low pressure has weakened into a low pressure and now lies over is over west Madya Pradesh and adjoining Rajasthan while the upper air cyclonic circulation is south-west of the weather system. Another upper air cyclonic circulation has formed in the north-west Bay of Bengal. The Fifth monsoon spell hit the northern areas on July 24 with 1 day error, first mentioned by PWP on July 20. After 12 to 24 hours, the intensity would decrease in the north and the monsoon focus would shift towards south Punjab. After south Punjab, rains can shift towards Sindh including Karachi. More rain with thunder/lightning can occur in Islamabad, northern Punjab (Lahore, Rawalpindi, Murree city, Jhelum, Gujrat, Sialkot, Norwal, Sheikpura, Gujranwala, Attock, Mandi Bahauddin and few adjoining districts), Khyber Pakhtunkhwa (Abbottabad, Manshera, Haripur, Swabi, Swat, Peshawar, Landi Kotal, Hangu, Kohat, Khyber Agency, Khurram Agency and few adjoining districts) and Azad Kashmir (Muzaffarabad, Kotli, Mirpur and few adjoining areas). There are chances of isolated heavy falls in northern areas of Punjab and few parts of Khyber Pakhtunkhwa (Kurram Agency, Khyber Agency, Orakazi Agency, Kohat, Hangu and adjoining districts) and some parts of Azad Kashmir (Rawalakot, Mirpur, Kotli and adjoining areas) till July 25 mid-day. The fifth spell in the north can last till July 27 though a decrease in it’s intensity is expected from July 25 mid-day. A sixth monsoon spell can start in the northern areas during the coming week, PWP upgrades the chances to‘moderate’. During the fifth spell, chances of rain with moderate falls along with thunder/lightning on July 24 late night/July 25 and July 26 in south and central areas of Punjab (Faisalabad, Multan, Bahawalnagar, Bahawalpur,Vehari, Dera Ghazi Khan, Okara, Pak Pattan and few adjoining areas). Slight chances of isolated heavy falls in Bahawalnagar district during that period. Noorpul Thal got 102 mm. Isolated heavy falls cannot be ruled out in the North! After rains in south Punjab – Sindh including Karachi’s turn can come! Upper air cyclonic circulation over Haryana and adjoining areas persists. Yesterday’s well-marked low pressure is over Odisha while the upper air cyclonic circulation is south-west of the weather system. The fifth monsoon spell can start in the northern areas on July 25 (+1,-1 day error), PWP upgrades the chances to ‘extremely high’ during that period, rain with thunder/lightning can occur in Islamabad, northern Punjab (Lahore, Rawalpindi, Murree city, Jhelum, Gujrat, Sialkot, Norwal, Sheikpura, Gujranwala, Attock, Mandi Bahauddin and few adjoining districts), Khyber Pakhtunkhwa (Abbottabad, Manshera, Haripur, Swabi, Swat, Peshawar, Landi Kotal, Hangu, Kohat, Khyber Agency, Khurram Agency and few adjoining districts) and Azad Kashmir (Muzaffarabad, Kotli, Mirpur and few adjoining areas). There are chances of isolated heavy falls in northern areas of Punjab and few parts of Khyber Pakhtunkhwa (Kurram Agency, Khyber Agency, Orakazi Agency, Kohat, Hangu and adjoining districts) and some parts of Azad Kashmir (Rawalakot, Mirpur, Kotli and adjoining areas). The fifth spell in the north can last till 48 hours depending upon the date they hit, a sixth spell for the north is also seen. During the fifth spell, chances of rain with moderate falls along with thunder/lightning on July 24 late night/July 25 and July 26 in south and central areas of Punjab (Faisalabad, Multan, Bahawalnagar, Bahawalpur,Vehari, Dera Ghazi Khan, Okara, Pak Pattan and few adjoining areas). Lower Dir got 17 mm. Upper air cyclonic circulation over Haryana and adjoining areas persists. Yesterday’s upper air cyclonic circulation over north Chhatisgarh and adjoining area is now over east Madya Pradesh. Low pressure over the north-west Bay of Bengal persists, it has intensified into a strong well-marked low pressure over the same area. Fourth spell has ended in the northern areas, partly/mostly cloudy with chances of rain/showers with thunder/lightning persists in Islamabad, northern Punjab, Azad Kashmir and few areas of Khyber Pakhtunkhwa tomorrow. A fifth spell can start in the northern areas on July 25 (+1,-1 day error) during that period there are chances of rain in the central areas (south Punjab) as well therefore PWP upgrades the chances of fifth spell to ‘high’. Alert for further scattered heavy downpour in North taken back! Chances of rain in central areas this week! Upper air cyclonic circulation over Haryana and adjoining areas. Another upper air cyclonic circulation over north Chhatisgarh and adjoining area. Western system ’14′ is moving eastwards. Low pressure over the north-west Bay of Bengal persists, it can intensify into a well-marked low pressure. The fourth monsoon spell has weakened early than expected as western system ’14′ has started moving eastwards therefore a decrease in intensity of rains has occurred. Despite the weakening, rain with thunder/lightning can occur late night in Islamabad, northern Punjab (Lahore, Rawalpindi, Murree city, Jhelum, Gujrat, Sialkot, Norwal, Sheikpura, Gujranwala, Attock, Mandi Bahauddin and few adjoining districts), Khyber Pakhtunkhwa (Abbottabad, Manshera, Haripur, Swabi, Swat, Peshawar, Landi Kotal, Hangu, Kohat, Khyber Agency, Khurram Agency and few adjoining districts) and Azad Kashmir (Muzaffarabad, Kotli, Mirpur and few adjoining areas). After the fourth spell that can end on July 22/July 23, a fifth spell can start in the northern areas on July 25 (+1,-1 day error) during that period there are chances of rain in the central areas (south Punjab) as well therefore PWP grades the chances of fifth spell to ‘moderate’. More scattered heavy downpour likely in North! Upper air cyclonic circulation over Indian Punjab and adjoining areas persists. Another upper air cyclonic circulation over north-east Madya Pradesh and adjoining area persists. Western system ’14′ lies over the northern areas of the country. Low pressure over the north-west Bay of Bengal. The fourth monsoon spell has hit the northern areas on July 20 (+1,-1 day error) as predicted in Pakistan Weather Update of July 16. During the fourth spell, rain at times heavy and thunder/lightning in Islamabad, northern Punjab (Lahore, Rawalpindi, Murree city, Jhelum, Gujrat, Faisalabad, Sialkot, Norwal, Sheikpura, Gujranwala, Attock, Mandi Bahauddin and few adjoining districts), Khyber Pakhtunkhwa (Abbottabad, Manshera, Haripur, Swabi, Swat, Peshawar, Landi Kotal, Hangu, Kohat, Khyber Agency, Khurram Agency and few adjoining districts) and Azad Kashmir (Muzaffarabad, Kotli, Mirpur and few adjoining areas). There are chances of isolated very heavy rainfall in northern areas of Punjab and few parts of Khyber Pakhtunkhwa (Kurram Agency, Khyber Agency, Orakazi Agency, Kohat and adjoining districts) and some parts of Azad Kashmir (Rawalakot, Mirpur, Kotli and adjoining areas). After the fourth spell that can weaken by July 22/July 23, a fifth spell can occur in the northern areas during the coming week. Lower Dir got 23 mm. Saidu Sharif got 16 mm. Scattered heavy downpour expected in the northern in coming days! Yesterday’s upper air cyclonic circulation over Utter Pradesh persists while yesterday’s low pressure over north-west Bay of Bengal merged with the monsoon trough. Another upper air cyclonic circulation lies over north-eastern parts of India. Weak western trough ’13′ is over the northern areas of the country is moving eastwards now. Significant rain occurred in Risalpur – 101 mm! Yesterday’s upper air cyclonic circulation over Haryana moves into Utter Pradesh state while yesterday’s low pressure over north-west Bay of Bengal, it now lies over East Madya Pradesh and adjoining Chhattisgarh. A fresh but weak western trough ’13′ is over the northern areas of the country. The third monsoon spell in the northern areas has started weakening, it can continue till July 18. During that period, chances of rain with thunder/lightning in Islamabad, north-eastern Punjab (Lahore, Rawalpindi, Murree city, Jhelum, Gujrat, Faisalabad, Sialkot, Norwal, Sheikpura, Gujranwala, Attock, Mandi Bahauddin and few adjoining districts), Khyber Pakhtunkhwa (Abbottabad, Manshera, Haripur, Swabi, Swat, Peshawar, Landi Kotal, Hangu, Kohat, Khyber Agency, Khurram Agency and few adjoining districts) and Azad Kashmir (Muzaffarabad, Kotli, Mirpur and few adjoining areas). After the third spell, a fourth spell can start after few days which has better rain coverage in the country. PWP upgrades the chances of fourth spell from ‘high’ to ‘very high’ in the northern areas. Saidu Sharif got 9 mm. An upper air cyclonic circulation over Haryana now lies over Haryana and adjoining Indian state while yesterday’s low pressure over north-west Bay of Bengal, it now lies over West Bengal, Odisha coast and adjoining Bay of Bengal, it may move into Jharkhand and Chattisgarh. A fresh but weak western trough ’13′ is over the northern areas of the country. The third monsoon spell continues in the northern areas. During that period, chances of rain with thunder/lightning in Islamabad, north-eastern Punjab (Lahore, Rawalpindi, Murree city, Jhelum, Gujrat, Faisalabad, Sialkot, Norwal, Sheikpura, Gujranwala, Attock, Mandi Bahauddin and few adjoining districts), Khyber Pakhtunkhwa (Abbottabad, Manshera, Haripur, Swabi, Swat, Peshawar, Landi Kotal, Hangu, Kohat, Khyber Agency, Khurram Agency and few adjoining districts) and Azad Kashmir (Muzaffarabad, Kotli, Mirpur and few adjoining areas with chances of isolated heavy falls). The third spell which will continue till July 17/July 18 is weaker and isolated when compared to the second spell. After the third spell, a fourth spell can start after few days which has better rain coverage in the country. PWP upgrades the chances of fourth spell from ‘moderate’ to ‘high’ in the northern areas. Chance of Fourth Spell upgraded to ‘moderate’ in North! An upper air cyclonic circulation over Rajasthan now lies over Haryana while yesterday’s upper air cyclonic circulation over north-west Bay of Bengal has intensified into a low pressure. A fresh but weak western trough ’13′ is over the northern areas of the country. The third monsoon spell in the northern has started from July 15 (+1,-1 day error) as predicted by PWP on July 9. During that period, chances of rain with thunder/lightning in Islamabad, north-eastern Punjab (Lahore, Rawalpindi, Murree city, Jhelum, Gujrat, Faisalabad, Sialkot, Norwal, Sheikpura, Gujranwala, Attock, Mandi Bahauddin and few adjoining districts), Khyber Pakhtunkhwa (Abbottabad, Manshera, Haripur, Swabi, Swat, Peshawar, Landi Kotal, Hangu, Kohat, Khyber Agency, Khurram Agency and few adjoining districts) and Azad Kashmir (Muzaffarabad, Kotli, Mirpur and few adjoining areas with chances of isolated heavy falls). The third spell which will continue till July 17/July 18 is weaker and isolated when compared to the second spell. After the third spell, a fourth spell can start after few days which has better rain coverage in the country. PWP upgrades the fourth spell at ‘moderate’ in the northern areas. Lower Dir got 8 mm. Saidu Sharif got 5 mm. South Punjab is again close in witnessing showers! Yesterday’s low pressure has dissipated, an upper air cyclonic circulation lies over Rajasthan while another has formed over north-west Bay of Bengal. A fresh but weak western trough ’13′ can approach the northern areas of the country on July 15/July 16. The third monsoon spell in the northern areas can start around July 15 (+1,-1 day error), PWP maintains the chances at ‘extremely high’. During that period, chances of rain with thunder/lightning in Islamabad, north-eastern Punjab (Lahore, Rawalpindi, Murree city, Jhelum, Gujrat, Faisalabad, Sialkot, Norwal, Sheikpura, Gujranwala, Attock, Mandi Bahauddin and few adjoining districts), Khyber Pakhtunkhwa (Abbottabad, Manshera, Haripur, Swabi, Swat, Peshawar, Landi Kotal, Hangu, Kohat, Khyber Agency, Khurram Agency and few adjoining districts) and Azad Kashmir (Muzaffarabad, Kotli, Mirpur and few adjoining areas with chances of isolated heavy falls). The third spell is weaker and isolated when compared to the second spell. After the third spell, a fourth spell can start after few days which has better rain coverage in the country. Weak Monsoon Spell started in Sindh! Third Monsoon can start in northern areas in few days! Yesterday’s low pressure is now over East Madya Pradesh and adjoining East Rajasthan and has moved in a WNW direction, according to GFS T547, it can move in NNE direction into Utter Pradesh and weaken. The upper air cyclonic circulation over south-east Rajasthan and adjoining Gujarat is moving into Sindh province. The third monsoon spell in the northern areas can start around July 15 (+1,-1 day error), PWP upgrades the chances at ‘extremely high’. During that period, chances of rain with thunder/lightning in Islamabad, north-eastern Punjab (Lahore, Rawalpindi, Murree city, Jhelum, Gujrat, Faisalabad, Sialkot, Norwal, Sheikpura, Gujranwala, Attock, Mandi Bahauddin and few adjoining districts), Khyber Pakhtunkhwa (Abbottabad, Manshera, Haripur, Swabi, Swat, Peshawar, Landi Kotal, Hangu, Kohat, Khyber Agency, Khurram Agency and few adjoining districts) and Azad Kashmir (Muzaffarabad, Kotli, Mirpur and few adjoining areas with chances of isolated heavy falls). The third spell is weaker and isolated when compared to the second spell. After the third spell, a fourth spell can start after few days which has better rain coverage. Clouds crossing into Sindh – reports of showers! Yesterday’s well-marked low pressure has rapidly moved inland and now lies over east Madya Pradesh. It may curve in a ENE/NNE direction towards Utter Pradesh, south Bihar and adjoining Jharkhand and weaken. The third monsoon spell in the northern areas can start around July 15 (+1,-1 day error), PWP maintains the chances at ‘very high’. During that period, chances of rain with thunder/lightning in Islamabad, north-eastern Punjab (Lahore, Rawalpindi, Murree city, Jhelum, Gujrat, Faisalabad, Sialkot, Norwal, Sheikpura, Gujranwala, Attock, Mandi Bahauddin and few adjoining districts), Khyber Pakhtunkhwa (Abbottabad, Manshera, Haripur, Swabi, Swat, Peshawar, Landi Kotal, Hangu, Kohat, Khyber Agency, Khurram Agency and few adjoining districts) and Azad Kashmir (Muzaffarabad, Kotli, Mirpur and few adjoining areas with chances of isolated heavy falls). The third spell is weaker when compared to the second spell. Weak cloud formation in various parts of the country! Western trough ’12′ now lies over Jammu & Kashmir and adjoining northern Pakistan. Yesterday’s low pressure has further intensified into a well-marked low pressure over Odisha coast and adjoining northern Andhra Pradesh and Bay of Bengal. It could move towards eastern Madya Pradesh and Chhattisgrah and by July 13/July 14 it may curve in a ENE/NNE direction towards Utter Pradesh, south Bihar and adjoining Jharkhand. The third monsoon spell in the northern areas can start during the mid-week of July that could be July 15 (+1,-1 day error), PWP upgrades the chances there from ’high’ to ’very high’. PWP maintains the chances at ‘moderate’ in central and southern parts. Western trough ’12′ now lies over the north-eastern parts of the country, it is moving into Jammu & Kashmir. Yesterday’s Upper air cyclonic circulation has intensified into a low pressure over Odisha and adjoining Bay of Bengal. Circulation over Haryana move towards Utter Pradesh. The third monsoon spell can start during the mid-week of July in some parts of the country, PWP upgrades the chances from ’moderate’ to ’high’ in the northern areas while maintains it at ‘moderate’ in central and southern areas. Noorpur Thal got 48 mm. Second Spell continues – More heavy rain possible! Western trough ’12′ is over the northern areas of the country, it is moving north-eastwards/eastwards. Upper air cyclonic circulation over eastern central coast of India and adjoining Bay of Bengal, it can move in a W/NW direction. The third monsoon spell can start during the mid-week of July in some parts of the country, PWP upgrades the chances to ‘moderate’. Under the influence of second monsoon spell, rain with thunder/lightning can occur in during late night/early morning in Islamabad, NE and north Punjab (Lahore, Sialkot, Gujranwala, Faisalabad, Sheikhpura, Rawalpindi (including Murree city), Jhelum, Gujarat, Mandi Bahauddin and few adjoining areas), parts of Khyber Pakhtunkhwa (Hangu, Kohat, Khyber Agency, Khurram Agency, Abbottabad, Manshera, Haripur, Swabi, Swat and few adjoining districts) and Azad Kashmir (Muzaffarabad, Kotli, Mirpur and few adjoining areas). Rain at times heavy (isolated very heavy in few areas) can occur in north-eastern and northern areas of Punjab from July 8 till July 10. Lower Dir got 15 mm. Saidu Sharif got 7 mm. Rain in many areas of Azad Kashmir, Punjab and Khyber! Western trough ’12′ is over the northern areas of the country. Weak Upper air cyclonic circulation persists over south-west Rajasthan and adjoining Pakistan is becoming unimportant. Upper air cyclonic circulation over west-central Bay of Bengal and adjoining coastal states of India. Under the influence of second monsoon spell, rain with thunder/lightning can occur in Islamabad, NE and north Punjab (Lahore, Sialkot, Gujranwala, Faisalabad, Sheikhpura, Rawalpindi (including Murree city), Jhelum, Gujarat, Mandi Bahauddin and few adjoining areas), parts of Khyber Pakhtunkhwa (Hangu, Kohat, Khyber Agency, Khurram Agency, Abbottabad, Manshera, Haripur, Swabi, Swat and few adjoining districts) and Azad Kashmir (Muzaffarabad, Kotli, Mirpur and few adjoining areas). Rain at times heavy (isolated very heavy in few areas) can occur in north-eastern and northern areas of Punjab from July 8 till July 10. Saidu Sharif got 10 mm. Weak Upper air cyclonic circulation persists over south-west Rajasthan and adjoining Pakistan, it could persist till early coming week, another lies over western sector of the Bay of Bengal. Under the influence of second monsoon spell, rain with thunder/lightning can occur in Islamabad, NE and north Punjab (Lahore, Sialkot, Gujranwala, Faisalabad, Sheikhpura, Rawalpindi (including Murree city), Jhelum, Gujarat, Mandi Bahauddin and few adjoining areas), parts of Khyber Pakhtunkhwa (Hangu, Kohat, Khyber Agency, Khurram Agency, Abbottabad, Manshera, Haripur, Swabi, Swat and few adjoining districts) and Azad Kashmir (Muzaffarabad, Kotli, Mirpur and few adjoining areas). Rain at times heavy (isolated very heavy in few areas) can occur in north-eastern and northern areas of Punjab from July 7 night/July 8. Saidu Sharif got 25 mm. Heavy rain lashes Sialkot – 80 mm rain recorded! Second monsoon spell advances into north Pakistan! Upper air cyclonic circulation is now over south-west Rajasthan and adjoining Pakistan, it has weakened and may persist till some more days, another lies over western sector of the Bay of Bengal. Second Monsoon spell has hit the upper areas of Pakistan with -1 day error that was first mentioned by PWP in it’s weather update article on June 28, on July 7 further advancement is expected. Monsoon rains can advance into Sindh and South Punjab during early mid-week of July as a fresh low pressure can bring rains to Sindh on July 13/July 14, less probability for South Punjab. Some advancement was seen in eastern Sindh on July 4 while slight advance in eastern south Punjab on July 6. Thundercloud that formed over Awaran district of Balochistan is dissipating over Panjgur. Thunderstorm dissipating over Punjab, another dissipating over north-eastern Balochistan. Fresh thundercloud forming over upper Khyber Pakhtunkhwa under that influence rain with thunder/lightning can occur in Islamabad, NE and north Punjab (Lahore, Sialkot, Gujranwala, Faisalabad, Sheikhpura, Rawalpindi (including Murree city), Jhelum, Gujarat, Mandi Bahauddin and few adjoining areas), parts of Khyber Pakhtunkhwa (Hangu, Kohat, Khyber Agency, Khurram Agency, Abbottabad, Manshera, Haripur, Swabi, Swat and few adjoining districts) and Azad Kashmir (Muzaffarabad, Kotli, Mirpur and few adjoining areas). Rain at times heavy (isolated very heavy in few areas) can occur in north-eastern and northern areas of Punjab from July 7 night/July 8. Yesterday’s low pressure over East Rajasthan and adjoining Madya Pradesh has merged with the monsoon axis of monsoon while an upper air cyclonic circulation over Gujarat and adjoining Sindh & Rajasthan has weakened. Fresh circulation in the Bay of Bengal can form on July 6 or July 7. Second Monsoon spell in the north can start on July 7 (+1, -1 day error) therefore PWP maintains the chance of second spell in the northern areas at ’extremely high’. Monsoon rains can advance into Sindh and South Punjab during early mid-week of July as a fresh low pressure can bring rains to Sindh on July 13/July 14, less probability for South Punjab . Rain at times heavy (isolated very heavy in few areas) can occur on July 8 till July 10 early in the Northern and North-eastern districts of Punjab (Lahore, Sialkot, Gujranwala, Faisalabad, Sheikhpura, Rawalpindi (including Murree city), Jhelum, Gujarat, Mandi Bahauddin and few adjoining areas). Rain with thunder/lightning is also likely in Islamabad, Khyber Pakhtunkhwa (Hangu, Kohat, Khyber Agency, Khurram Agency, Abbottabad, Manshera, Haripur, Swabi and few adjoining districts) and Azad Kashmir (Muzaffarabad, Kotli, Mirpur and few adjoining areas) especially during July 8 and July 9. During this time period, the chances of showers will persist Tharparkar, Umerkot, Sanghar, Khairpur, Badin, Karachi, Thatta, Jamshoro and few adjoining districts of Sindh . Increase in clouds with moist winds in south Punjab (drizzle/showers can occur in Rahim Yar Khan, Bahawalpur and Bahawalnagar district). Heavy rainfall can occur in Upper Punjab in few days! Yesterday’s low pressure over Madya Pradesh now lies over East Rajasthan and adjoining Madya Pradesh with an upper air cyclonic circulation over Gujarat. Second Monsoon spell in the north can start on July 7 (+1, -1 day error) ]therefore PWP upgrades the chance of second spell in the northern areas from ’very’ to ’extremely high’. Mandi Bahauddin got 1 mm. Yesterday’s low pressure over north-east Madya Pradesh and adjoining Chhatisgrah now lies over Madya Pradesh, cluster of thunderstorms are seen moving towards Gujarat, Rajasthan and adjoining Indian coast in a SSW direction. After many days, the cloud activity has been observed near Sindh and adjoining south Punjab. Clouds are seen moving from Indian and adjoining Sindh coast towards Oman, last time it was observed during the pre-monsoon spell. Mostly dry weather expected in the country, chances of drizzle/isolated showers in Bahawalpur, Bahawalnagar districts of South Punjab as weak thundercloud is forming nearby. Passing clouds in South-eastern Sindh with chances of drizzle/isolated showers as weak thundercloud can cross during the night. Chances of drizzle in the coastal areas of Sindh. Western trough ’11′ lies over Jammu & Kashmir. The Low pressure over Utter Pradesh has retracted and now lies over north-east Madya Pradesh and adjoining Chhatisgarh. Second monsoon spell can start early from the second week of July that is July 7 with -1, +1 day error therefore PWP upgrades the second spell in the northern areas from ’poor’ to ’moderate’ to ’high’. During this time period, showers can occur in SE and coastal Sindh as well. Increase in clouds with moist winds in south Punjab. First Monsoon spell has mostly ended! Western trough ’11′ is now over the north-eastern areas of the country, lies over Jammu & Kashmir. The Low pressure persists over the same area, Utter Pradesh. The first spell of monsoon in the northern areas has weakened in the northern areas though it is expected to continue till tonight after that it will be in dissipating stages. 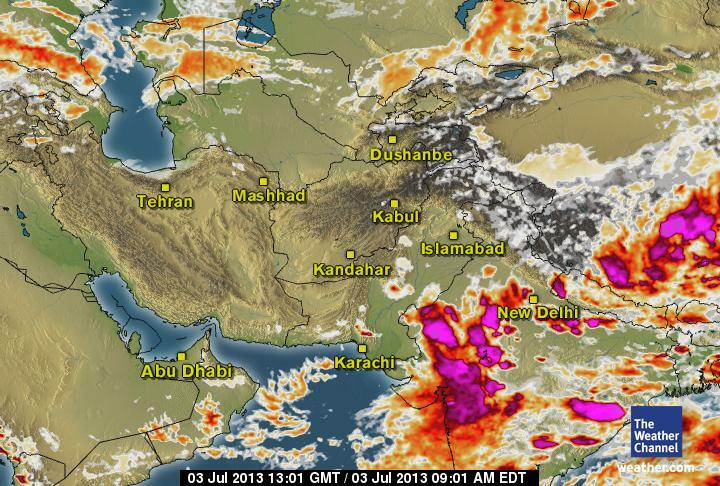 ← Pakistan Weather Portal (PWP) – July 2013 in Review! Yes I am well aware that ISB Airport is in Rawalpindi since the rain stats of provincial capitals were taken from the Airport I thought that the rain stats of ‘Islamabad Airport’ should be taken. But anyways I will change it. babar bhai Eid pr Mirpurkhas City ka weather kexa rahy ga?? ?